Conventional beam and slide weight balances are accurate but too slow for large volume laboratory work. Torsion balances speed volume weighing. The new two-dial torsion balances manufactured by The Torsion Balance Company, Clifton, New Jersey, provides both high speed and high accuracy. 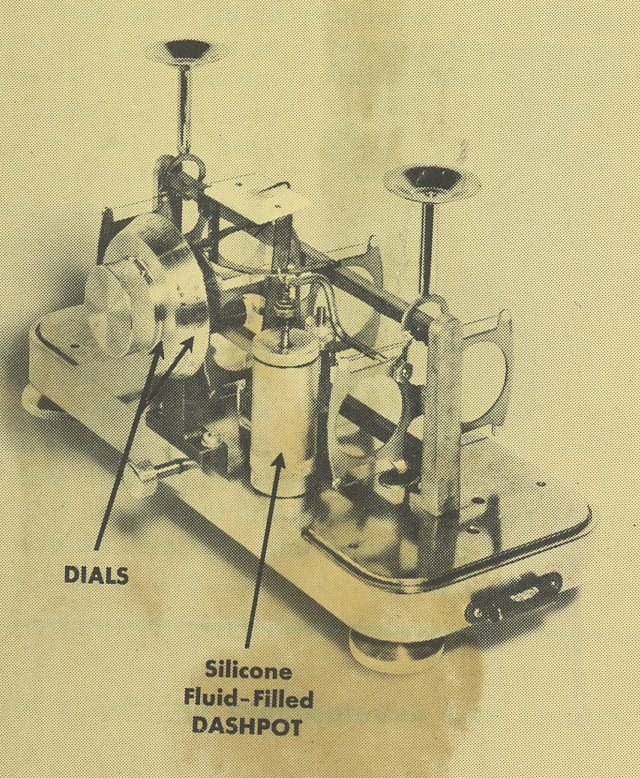 These units maintain accuracy up to two milligrams and offer two major time-saving features: (1) unique two-dial torsion principle allows both weight loading and fine adjustment without arresting the balance; (2) fast damping of balance oscillations with a silicone-fluid-filled dashpot permits quick, accurate dial readings. These silicone-fluid damped balances offer consistent uniform damping and dependability in use over a wide ambient temperature span, and over long periods of service. Heat-stable and oxidation resistant, the Dow Corning silicone fluid utilized in these balances retains near constant viscosity from —40 F to 400 F, does not tend to thicken or gum on aging, assures uniform damping force. According to Torsion Balance design engineers, accuracy is retained even after more than one million test weighings.